When a sleep study (polysomnograph or home sleep test) has been completed on a patient, the data needs to be processed in order for it to be clinically useful. This usually means that the sleep study data will be reviewed by a sleep technician or technologist (RPSGT or RST) and a sleep physician. A few decades ago, the information was collected on stacks of paper with ink pens. Today’s technology allows for the storage and processing of this information in a digital format. 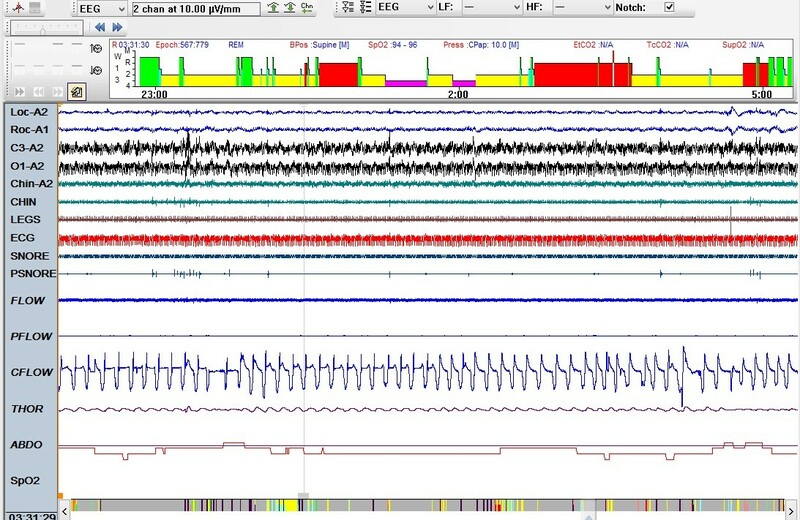 On the sleep recording equipment, there are several biologic parameters that are measured including: (EEG)electroencephalogram, electrooculogram for eye movements (EOG), electromyogram- muscle activity (EMG), electrocardiogram for cardiac/heart (EKG), snore microphone, airflow signal, thoracic/abdominal respiratory effort movements, and blood oxygen levels from an oxymetry probe that is placed on one of the fingers. Usually video and audio are collected. After this data is collected on a patient, the data is reviewed page-by-page by a technologist who will score, or tabulate, all of this data into organized packets of clinical information. After sleep study scoring is completed by the sleep tech, it will be sent to a sleep physician who will re-review this data and scored tech report and issue a sleep physician interpretation of the sleep study, and often recommendations. The sleep physician’s report will then be sent back to the referring clinician who will present the findings to the patient. Treatment options are often discussed as well. What is a sleep technologist and sleep technician? These are professionals who specialize in the collection and processing of sleep study information. Historically, these were respiratory therapists, neurology technician, and other allied healthcare professionals who became interested in the sleep field. Today, there are several schools that tech polysomnographic technology. Students may become registered or certified in the field and are often required to maintain education credits to show proficiency in sleep technology. There are a few professional sleep technologist services that specialize in the outsource scoring of sleep studies and Sleep Study Scoring Services.